Kale has become a hot & trendy little vegetable lately, which is fine by me because I love finding it on restaurant menus everywhere I go. But I’ve been a kale admirer for many years and it’ll continue to be my favorite leafy green even when its fifteen minutes of foodie fame are up. I absolutely love this powerhouse vegetable. Every time I eat raw kale I feel amazing inside. It’s the only food that has an almost instant effect, making me feel like I’m doing my body good by eating it. And it tastes amazing! It’s so earthy and hearty and the flavor changes and intensifies based on what you do with it. I love it roasted, steamed, sautéed, juiced, baked, and, of course, in ‘chip’ form, but the best way to eat kale is most definitely raw. I sometimes like to just toss it with olive oil, sea salt, lemon and a touch of maple syrup; but this easy sesame dressing is one of my all-time favorites and it stands up to and pairs so nicely with the boldness of kale. I make this sesame dressing often. When I feel like cleaning a slightly bigger mess, I use a blender to mix it, which gives a really nice, smooth and creamy consistency. But when I don’t have the patience, I just whisk it up in a small bowl and add the hot water in a little bit at a time while whisking to smooth it out. The photos here show a dinner salad that I made last week with a mix of red and green kale, raw cauliflower and crunchy bean sprouts. Kale is a great green to eat as a meal because it’s so filling and full of goodness. And it holds up nicely as a weekday take-to-work lunch salad because it doesn’t really get soggy like other lettuces when it’s dressed. This dressing would also be amazing on sautéed or steamed spinach with some sesame seeds sprinkled on top. Use a blender or a small mixing bowl and whisk. Mix the tahini, tamari soy and agave until blended. Add in hot water a little bit at a time until you get a consistency that you like. 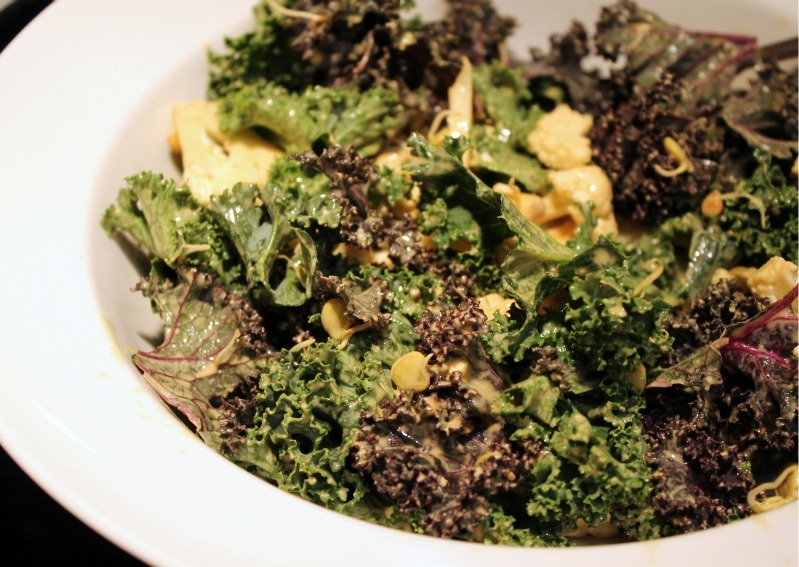 Toss kale with sesame dressing and sprinkle with sesame seeds. * I did find this general recipe online somewhere a few years ago but I can’t remember where it came from so I can’t source it properly. 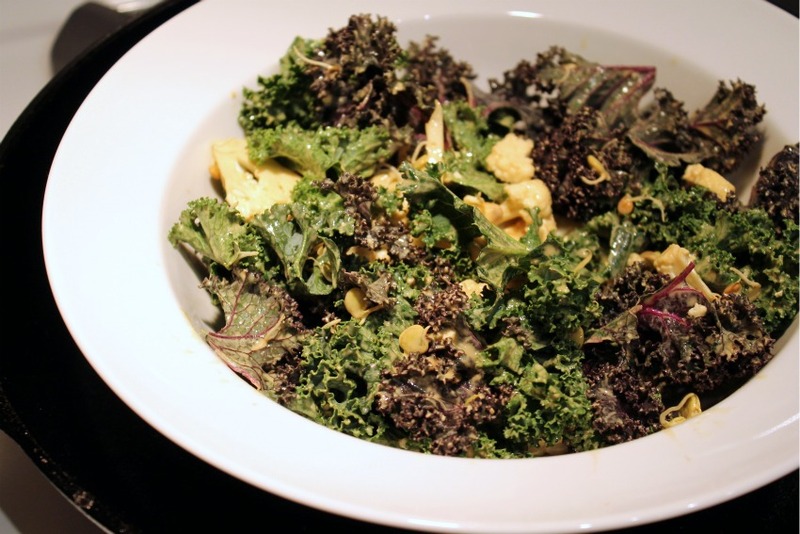 This Kale salad looks wonderful. We just created Kale soup for the first time. I think will try making this salad next.